Recently relaunched with a number of small refinements, the new Vortex Viper binoculars sit just one step below the company's nature observation flagship range, the Razor HD, from which the 8x42 was reviewed in Birdwatch 273: 70. The Viper HD 8x42 is smaller and more compact compared with the corresponding model in the Razor HD range, although the weights of the two models are almost equal. While it would not necessarily be described as a 'budget' binocular, the Viper retails at little more than half the price of the Razor and, having used both, the difference in image reproduction is clearly detectable. The build quality of the Viper, however, matches that of the Razor. It is well balanced with a marvellously solid feel and more than adequate rubber armouring, which is attractively contoured and textured to increase grip. Shallow cutaways below the oculars are extensive enough to support almost all thumb sizes, while the shape of the objective housing and the non-slip rubber armour serve to increase traction between the tethered loop objective covers and the chassis. This is one of the few binoculars I've tested from which this style of cover does not become at all easily detached. The rubber-ribbed central focusing wheel has some of the smoothest turning mechanics I have ever encountered in a binocular, with approximately 1.5 clockwise turns sending the user gliding from close focus to infinity. If your close focus requirements are important, then test this before you buy. It's billed by Vortex as 1.5 m, but on my test model I was not able to focus on any object closer than 2.1 m.
Single-eye adjustment is achieved via a pull-up, hard-milled ring, just below the right ocular. I found it rather sensitive to move, but there is no requirement to twist out the eyecup in order to operate it. Pushing it down after focusing locks it firmly in place There are three optional, loosely locking, twist-out positions for the eyecups, which have thin rubber rims that are more comfortable against the eyes than they may initially appear. When they were adjusted to the second and third extended positions, though, I was unable to see the full field of view. One of the improvements over the previous Viper models is said to be a wider field of view. This may be so, but to my eyes this appears to be at the expense of edge-to-edge sharpness and I would estimate approximately 20 per cent of the field's periphery is not 100 per cent sharp. Edge of field curvature is relatively minor, however, and the image is very bright – even in conditions of low light intensity. This is a function of the high light transmission, with 96 per cent being no idle boast and matching those few at the very top of the performance curve. The overall colour rendition is neutral and the colours are clear and vibrant, with chromatic aberration running at a pleasingly low level. 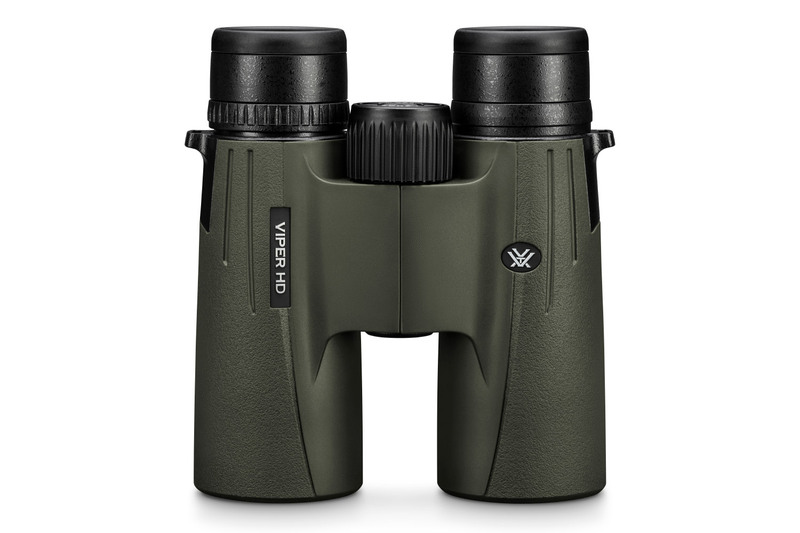 It's worth mentioning that ED glass is used in this binocular, along with Vortex proprietary XR anti-reflective coatings, fully multi-coated on all air-to-glass lens surfaces. The lens exteriors are protected by ArmorTek, said to be an ultrahard, scratch-resistant compound that repels oil, dirt and the corrosive salts of fingerprints. I discovered it also repels water, droplets of which simply pearl and run off, although this is not mentioned by Vortex. Harness users will be pleased to learn the Viper models are supplied complete with a binocular harness pack (known as a GlassPak), which enables wearers to carry them in their own soft, protective case, allowing their immediate access and use.